Pumpkin pie is one of my favorite Thanksgiving recipes, but it always seems to hit the table at precisely the point that I internally declare that I can’t possibly eat any more. I need a new approach, or at least a new recipe to add to my Thanksgiving menu. To the rescue: this lighter, luscious Frozen Pumpkin Mousse Pie that’s going to preserve my love for pumpkin pie as well as my waistline. Eggs, heavy cream and a butter stuffed crust, usually bog down the traditional pumpkin pie. In this lighter version, we get a creamy texture from low-fat ice cream, and a flavor punch from the gingersnap and raisin crust. We cut 254 calories from the original recipe. Find out how much fat you’ll save by making this healthier recipe with this comparison. Now I can enjoy dessert without busting my belt. Want more Thanksgiving inspiration? Check out more delicious Thanksgiving side dishes and desserts recipes. Pumpkin Pie with Rum: Dark molasses and dark rum put this pumpkin pie a cut above the rest. Nonfat evaporated milk, which stands in for heavy cream, does a fantastic job of cutting the fat in the filling. Add to that our blue ribbon butter-canola crust and you've dropped three-quarters of the fat and more than half the calories found in most similar pies. Don't use pumpkin-pie mix—buy canned pumpkin without added spices: the flavor will be superior. Classic Pumpkin Pie: The name says it all, really. We keep this version healthy by making the simple switch from evaporated whole milk to evaporated skim milk, which lowers the saturated fat in your pie, while maintaining its rich texture. 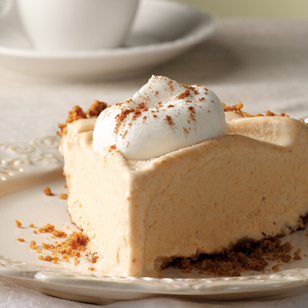 Frozen Pumpkin Mousse Pie: While pumpkin pie deserves respect as a Thanksgiving icon, it’s fun to shake up tradition. Surprise your family and friends with a frozen pie this year—it just might become one of their holiday favorites. No need to let them know how easy it is. To make ahead: Cover and freeze the pie for up to 3 days.